Click here to order an Affymetrix GeneChip expression assay. 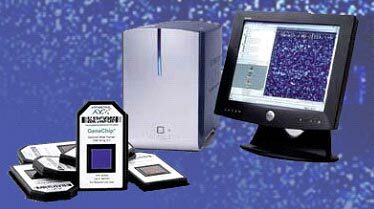 The CGF utilizes several different commercial assays to generate hybridization targets for Affymetrix microarray studies, depending on the type and quality of the input samples. The Ambion MessageAmp Premier and the Ambion WT Expression Labeling assays are used to generate hybridization targets from high quality, highly abundant RNA samples. The NuGen Ovation FFPE WTA assay is used to generate hybridization targets from degraded RNA samples. Investigators may choose to have the CGF extract and prepare RNA for them directly from frozen tissues or cell samples, FFPET samples, or they can choose to submit investigator-prepared RNA. High quality RNA is critical to the success of any microarray expression assay, so all samples generated within the CGF and investigator-prepared samples will be assessed for quality via the Nanodrop spectrophotometer and the Agilent Bioanalyzer. Investigators will be notified of all samples that do not meet Quality Control criteria for quantity and quality. Please see Sample Requirements below for more information. Affymetrix whole genome expression arrays are available for human, mouse, rat, and many other eukaryotic and prokaryotic model organisms. The Affymetrix whole transcript expression arrays, which assay alternatively spliced transcripts, are available for human, mouse, and rat. High quality array data depends upon high quality samples! RNA: Prior to target synthesis, the CGF will evaluate all submitted RNA samples for quantity and quality (amount of degradation). RNA will be quantified by UV absorbance using a Nanodrop spectrophotometer and validated to be non-degraded via the Agilent Bioanalyzer. A260:A280 ratios should be 1.8-2.0 and the RIN should be >7.0.Submit RNA in nuclease-free water. Fresh tissue should be flash frozen in 2.0 mL or Nunc tubes in LN2 or dry-ice and maintained at -80°C until submitted to the CGF. Cells should be pelleted in 1.5-2.0 mL tubes, all supernatant removed, and then flash frozen in LN2 and maintained at -80°C until submitted to the CGF. Tissue should be placed in RNAlater at 4°C overnight, then removed from the RNAlater and stored at -80°C indefinitely until submitted to the CGIF. Cell pellets should be placed in RNAlater at 4°C overnight, then stored at -80°C indefinitely until submitted to the CGF. Tissue and cell pellets should be homogenized immediately in either Qiagen Buffer RLT (recommended) or Trizol (not recommended) and then stored at -80°C until submitted to the CGF. Once samples have been extracted they will be assessed for quality, quantity, and concentration prior to beginning microarray assays. If you would like to order an array that is not listed, please contact the CGF. Complete coverage of the Human Genome U133 Set plus 6,500 additional genes for analysis of over 47,000 transcripts. The sequences from which these probe sets were derived were selected from GenBank®, dbEST, and RefSeq. The sequence clusters were created from the UniGene database (Build 133, April 20, 2001) and then refined by analysis and comparison with a number of other publicly available databases, including the Washington University EST trace repository and the University of California, Santa Cruz Golden-Path human genome database (April 2001 release). The GeneChip® Human Genome U133A 2.0 Array is a single array representing 14,500 well-characterized human genes that can be used to explore human biology and disease processes. New design and reduced feature size mean that you can use smaller sample volumes than the previous HG®U133A Array without compromising performance. With approximately four probes per exon and roughly 40 probes per gene, the GeneChip® Human Exon 1.0 ST Array enables two complementary levels of analysisâ€”gene expression and alternative splicing. Multiple probes per exon enable “exon-level” analysis and allow you to distinguish between different isoforms of a gene. This exon-level analysis on a whole-genome scale opens the door to detecting specific alterations in exon usage that may play a central role in disease mechanism and etiology. The second level is “gene-level” expression analysis, in which multiple probes on different exons are summarized into an expression value of all transcripts from the same gene. Exon arrays provide the most comprehensive coverage of the genome, including empirically supported and predicted transcribed sequences, enabling the discovery of previously unidentified novel events. The GeneChip® Human Gene 1.0 ST Array is the latest product in the family of Affymetrix expression arrays offering whole-transcript coverage. Each of the 28,869 genes is represented on the array by approximately 26 probes spread across the full length of the gene, providing a more complete and more accurate picture of gene expression than 3′ based expression array designs. 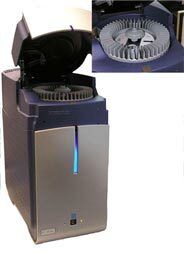 The small format of the array makes it a cost-effective expression profiling solution for new microarray users. The Gene 1.0 ST Array uses a subset of probes from the Human Exon 1.0 ST Array and covers only well-annotated content. Like the Exon 1.0 ST Array, “gene-level” analysis of multiple probes on different exons is summarized into an expression value representing all transcripts from the same gene. 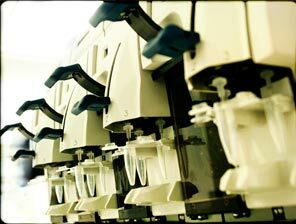 The GeneChip® Fluidics Station 450 is used for the wash and stain operation of Affymetrix GeneChip® arrays. The instrument includes design advancements to provide improved ease of use and true walk-away freedom dramatically improving efficiency in your genetic analysis. 1. How much RNA is required for each assay? 2. Where can I get a list of genes represented on the Affymetrix GeneChip® expression arrays? The sequences represented on all commercial GeneChip® expression arrays can be obtained from the Affymetrix website using the NetAffx™ Analysis Center or the annotation and sequence files. Annotation and sequence files contain the complete entries for all probe sets on the array, taken from the NetAffx Analysis Center. They are intended to be used primarily in spreadsheet applications and database programs (such as SQL databases). Interactive and batch queries can be performed in the NetAffx Analysis Center to find information for individual probe sets of interest. 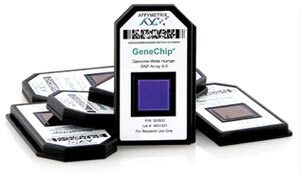 Annotation files are available for most Affymetrix GeneChip® Arrays. They are listed with other available support material on the various array support pages. 3. How can I find out if my genes of interest are on an Affymetrix GeneChip® expression array? The sequences represented on all commercial GeneChip® expression arrays can be obtained from the NetAffx™ Analysis Center.